Every Friday, at 4:30 p.m., local geeks are invited to pop a cold one at Tech Brewery in Ann Arbor. The start-up co-op, located in what was a brewery in the 1880s, rents space to network-hungry entrepreneurs. “Beer-30,” as the gathering is called, offers not just libations, but a good chance to tap into the mind of Dug Song, who runs the place. The 36-year-old Ann Arborite has guided two start-ups to a sizable acquisition and raised millions of dollars in venture capital for his digital security company, Duo Security. By any measure, Song is doing well. But he is less concerned with money than he is with helping others become successful, too. Song should know. He spent seven years as a founding chief security architect at Arbor Networks, working to protect 80 percent of the world's Internet service providers as the company grew to more than $120 million in annual revenue. Last year, it was sold for $225 million to Danaher, a science and technology company that designs, manufactures and markets innovative products and services. 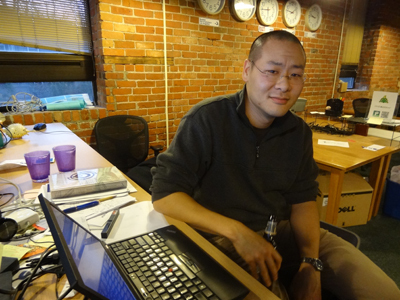 But Song sees room for improvement in how Ann Arbor treats innovation. He argues that it needs to be less top-down and bureaucratic; it should do away with non-compete clauses in hiring agreements; it has to bridge the town-gown disconnect; and it needs to create community hubs -- such as Tech Brewery -- for start-ups. Song believes Michigan needs to rely far less upon the auto industry, not just because of the economic impact of such dependence, but because the auto industry is a culture of what he says is harmful “zero-sum, siloed thinking” by highly competitive people who work only with people like themselves. For creative serendipity to occur, as it does in cities such as Boulder and Austin and in Silicon Valley, Michigan needs to offer grass-roots culture and events that support start-ups, that celebrate innovation rather than view it with suspicion, Song says. He’s doing his part by helping stage grass-roots events, and through education and networking. The monthly Ann Arbor New Tech, for instance, has more than 1,000 members who are interested in local high-tech start-ups. And about 500 people show up for Ignite Ann Arbor, which allows participants several minutes to speak for five minutes and show 20 slides about their passions. Song says he would love to see Ann Arbor become more like Boulder, Colo., where he attended a food, tech and music festival -- all rolled into one. When Britany Affolter-Caine became director of talent enhancement at Ann Arbor SPARK -- a regional economic development group -- this past summer, she knew she needed to connect with the local software industry. That meant she had to meet Dug Song. “Dug is a very important node in the entire software community,” she said. Song works from 9 to 5 at his office in the Tech Brewery, then heads home to his wife and two young children for family time from 5 p.m. to 9 p.m. He’ll often conclude most nights with another five hours of work on his laptop. Song says that if it weren’t for his wife, his daily lunches with co-workers and Beer-30 Friday nights, he wouldn’t have a social life at all. That’s the same for a lot of geeks, he says, adding that there must be regular events that force interaction and a sense of community. One of Song's mentors is TopSpin Media CEO and founder Ian Rogers. “Rogers always said that when faced with two choices in life, do whatever makes for a better story,” Song noted.